there is a situation (i don’t know what to really call it, other than scary) happening not far from us – less than a mile away. they’ve barricaded the bridge and are burning tires. there has been gunfire and bombs, but i don’t know any more than that. 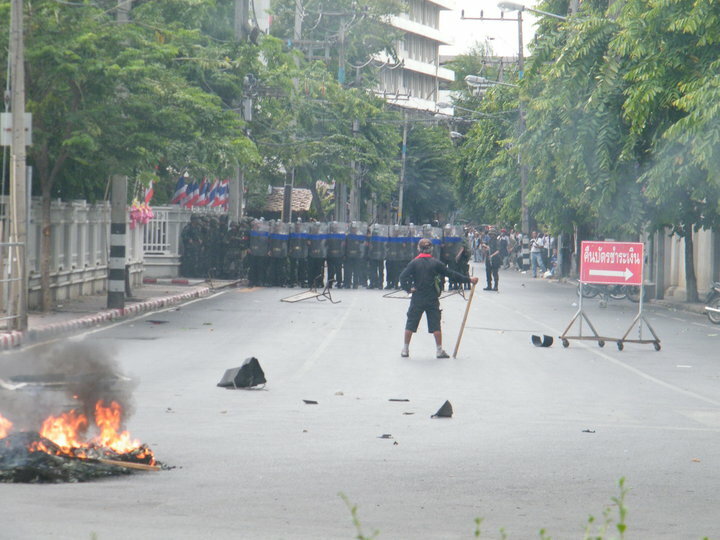 the red shirt leaders turned themselves in in bangkok and this has led to rioting in bangkok – burning and looting. i believe it’s possible that this is also the trigger to whatever is happening in chiang mai. as i type this there is a helicopter circling over head – i don’t think their focus is our neighborhood, we’re just close enough to the bridge. i don’t feel like we are in immediate danger. but i have no idea where this is headed. the two thai schools closest to our kids’s school have already announced they that will be closed the remainder of the week. (our school actually sits in the middle of the campus of one of these.) our househelp’s husband came by to tell us to stay in our house. and we have received similar advice from others. it’s been strongly suggested we keep our kids home for the next two days. we know just enough to be scared. This entry was posted in chiang mai, thailand and tagged red shirts. Bookmark the permalink.